The Monterey Bay Rose Society will hold a series of rose pruning workshops again this year. This group of dedicated and community-spirited rosarians offers to share its expertise, so that gardeners who also appreciate the Queen of Flowers will enjoy fine blossoms during the coming season. Species roses grow nicely with little or no care by gardeners. We occasionally read stories about “rose rustlers,” who are rose lovers who are fascinated by early rose varieties that have been lost to cultivation, and find them still growing unattended in cemeteries. Modern roses, particularly the popular hybrid tea roses, grow best with regular care and feeding. We prune modern roses to stimulate new growth, support good health, and promote desirable form. Well established roses respond quite well to dormant season pruning: they come back vigorously after even heavy pruning. If you have roses in your garden and lack confidence in your pruning talents, resolve to build and apply those skills this year. We are now within the rose’s dormant period, so the next few weeks is good time to schedule such a project. There are various ways to learn about rose pruning. When I need to learn about some aspect of gardening, I generally open relevant books in my collection or the library, or search the Internet’s vast resources on gardening techniques. To learn about pruning roses, a good place to look online is the website of the American Rose Society. When your search yields multiple “hits,” you can visit selected sites to find a tutorial that emboldens you to venture into your rose garden with clippers in hand. Some gardeners will learn best from a video demonstration. If that is your preference, direct your search results by clicking on “video” at the top of the computer screen. With today’s technology, it is easy to record a video demonstration and distribute it via the Interest. It is not easy, however, to produce a video recording that communicates effectively, so you might benefit by viewing several short video clips. This can be done in one sitting, and reveal both different presentations of basic technique and variations in the methods of different gardeners. Although much can be learned about rose pruning from printed and digital resources, the opportunity to learn directly from a friendly expert will be ideal for many gardeners, especially when the expert hands you the clippers and talks you through the process. The rosarians of the Monterey Bay Rose Society will offer the following free pruning workshops in the near future. January 27, 10:00 am, Mission San Antonio de Padua, Annual Cutting of the Roses, Jolon, CA. For driving directions, click here. For more information on the Society, visit its website. Prune your roses during this dormant season, and expect healthy plants and great blooms in the spring. If you have roses in your garden, right now would be a good time to examine your rosebuds. Look closely for small circular holes in the buds, and in blossoms that have already opened. These holes were caused by the rose curculio, also called the rose weevil (Merhynchites bicolor), which is a kind of beetle, about one-quarter inch long. The rose curculio’s damage ruins the blossoms and could ruin the entire plant if the gardener allows the insect to reproduce freely. Fortunately, the rose curculio is fairly easy to control because its life cycle takes a full year and follows predictable stages. Beginning in late May, the females crawl up the rose bushes to lay their eggs. Using their long snouts, they chew into the buds to feed and then turn to deposit their eggs in the buds. They could make multiple holes into a bud, and damage several buds. When the eggs hatch, the legless white larvae feed on the buds and on the blossoms as they mature. The buds often are weakened by the adult’s feeding and fall to the ground with the larvae still inside. The larvae burrow into the soil to pupate over winter, and, as adults, emerge in the late spring to continue the reproductive cycle. There are several ways to interrupt this cycle and avoid damage to your roses. The timing of your controlling action is important in blocking the creation of a new generation of insects. Starting in April, examine your roses to spot the adult rose curculio. They prefer roses with white or yellow blossoms, but could also be found on pink roses. When you find rose curculios, either pick the insects by hand or shake branches to make them fall on to a cloth or bucket. They will play dead, but will soon revive and crawl back up the plant, so don’t be deceived: drop them in soapy water, where they will drown. You could also spray the adults with insecticidal soap or neem oil, but this treatment requires direct contact will not affect the eggs or larvae. Predatory birds can be important allies in this process, so take steps to make your garden hospitable to birds by providing them with food, water, and shelter…and keeping synthetic chemicals out of your environment. When you see damaged buds or blossoms, remove them immediately and dispose of them through the green waste (not the compost). Be sure to remove drooping buds. These buds have been weakened by the rose curculio and could already be supporting its larvae. Once the larvae are in the soil, control measures are still possible. The most effective organic option is the importation of insect-parasitic nematodes, tiny worms that are natural predators of the larvae, and might already be present in the soil. These nematodes, which have been called “biological insecticides,” can be purchased from garden centers or the Internet, and imported into the rose bed. With fairly easy but timely efforts, you can control this pest and enjoy your roses in their undamaged, beautiful form and color. The roses are looking particularly good this year, and definitely worth protecting. The gardening subject with the most advice and the greatest anxiety is pruning roses. January is the right time of the year for this task (with some inevitable exceptions, which we’ll get to), so let’s review. Gardeners have good reasons for being uncertainty about pruning roses. The need for pruning arises from the gardener’s priorities, not the plant’s requirements. This is evident from the existence of wild roses and so-called “cemetery roses” that thrive for generations without the care of any gardener. Pruning and other forms of rose cultivation are intended to produce more blossoms, larger blossoms, more desirable plant forms, and healthier plants. If all roses were the same, pruning would be a simple matter, but the genus Rosa includes over 360 species, some of which are in cultivation since at least 500 B.C. This botanical diversity complicates the task: several of these species respond better to some pruning practices than to others. Several species have been hybridized extensively, and thousands of cultivars have been available. The cultivar, however, does not determine the preferred pruning practice; more important determinants include the species and the form. Roses are generally described in three major classifications: wild (or species) roses, old garden roses, and modern garden roses. Old garden roses typically bloom once on old growth each season and are cold hardy. They require only minimal pruning, which is done after blooming primarily to manage the overall size and shape of the plants. For this column, we’ll focus on modern roses, which by most accounts began in 1967. Modern garden roses are typically hybrids derived from the very old China roses. They are most popular in today’s gardens and characterized as blooming on new growth, and ever-blooming, i.e., they continue blooming throughout the growing season. They are not cold hardy and a hard freeze can kill branches or entire plants. In the Monterey Bay area, cold weather is not a significant threat to these plants. Pruning these plants begins with removing dead wood, and any branches that are diseased, broken or crossing other branches. These “clean up” actions prepare for cultivation pruning. Modern garden roses generally benefit from a hard pruning to stimulate the new growth that will produce blooms. This is done during dormancy before new growth begins. In the Monterey Bay area, the best time to prune these plants is in during January and February, so right now is a good time to begin your rose year. “Hard pruning” has various definitions, with most ranging between one-third to one-half of the canes. One approach calls for removing one-third of the canes entirely, then cutting the remaining canes by one-half. One intriguing approach to pruning modern garden roses is to simply cut the plant down to eighteen inches in height. Shearing a rose in this way has been claimed to yield the most foliage and blossoms. The so-called classical approach to rose pruning involves cutting canes to one-third or one-half, cutting at 45-degree angle to an outward-facing bud, opening the center of the plant for optimal light exposure, and removing branches that are thinner than a pencil. This approach yields larger stems, longer stems, and larger blossoms. Whether you use the classical or shearing approach to hard-pruning your modern garden roses, the important message is to prune them at this time of the year. They will respond beautifully in the spring. Rose season is upon us! New plants have arrived at most garden centers, and this is the right time to decide if your garden would benefit from the addition of a rose. The array of available varieties can be overwhelming, so preparation can streamline the selection process and increase your post-purchase comfort. As you assess your landscape’s need for a rose, decide whether you want a shrub, climbing, rambling, miniature, or standard (tree) rose. This choice could narrow your search dramatically, but if you focus on a shrub rose, you will find the largest number of choices. Another classification system identifies wild roses, old garden roses, and modern garden roses. The online resource Wikipedia provides a very welcoming and orderly overview of the seemingly countless kinds of roses. Hybrid tea roses are among the most popular kinds of the modern garden roses. Hybrid teas, which are widely available in garden centers, provide gorgeous blossoms in a wide and growing range of forms and colors and almost always a beguiling fragrance. Selection relies upon the individual gardener’s priorities, which might involve complementing the colors of the garden’s existing collection of roses. Local Master Rosarian Joe Truskot particularly appreciates the hybrid tea rose ‘Maria Callas’, which is also sold as “Miss All-American Beauty.’ Truskot is the author and publisher of the Central Coast Rose Manual, a valuable and unique resource for growing roses in the Monterey Bay area. This book can be found at Alladin Nursery (Watsonville), Bokay Nursery (Salinas), River House Books (Carmel), and Bookshop Santa Cruz (Santa Cruz). The adventuresome gardener might wish to explore the extensive world of species roses, which are plants that occur in nature, without help from humans. Depending on who is counting there are 100 species or more than 360 species. These are the true wildflowers of the rose genus, always with five petals in white, pink or red blossoms. They occur in diverse scents, foliage, hips, and autumn colors. They are valued in naturalistic planting schemes and for the minimal pruning requirements. They bloom on new wood, so they can be cut back after flowering. The species rose most likely found in a garden center is Rosa rugosa, also known as the Japanese Rose. (“rugosa” means “wrinkled,” referring to the plant’s corrugated leaves). Rosa rugosas are also available in various cultivars and hybridized with other species. Rosa californica is a fine addition in several ways to my native California bed, but it tends to spread through underground runners and develop a thicket. 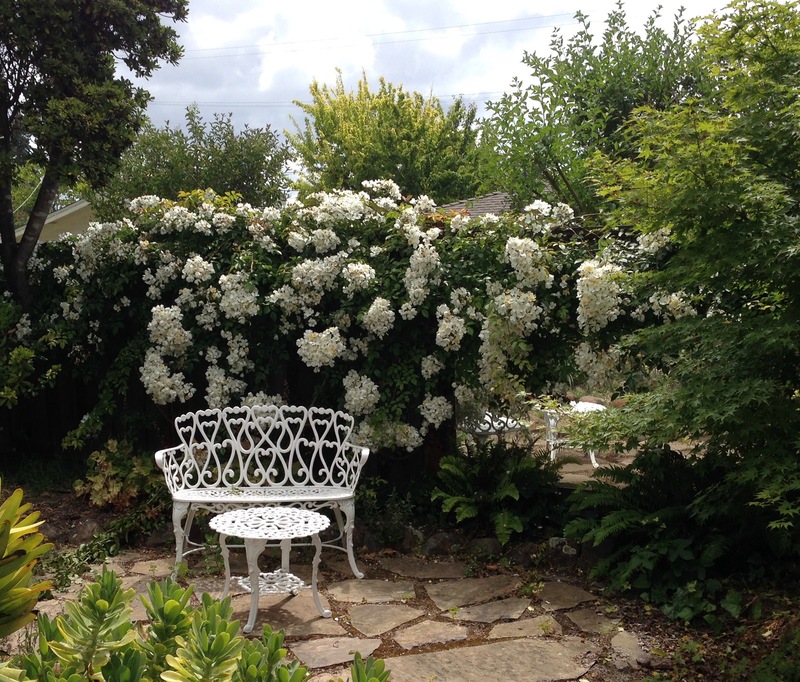 Rosa mulligani, a rambler that grows vigorously and produces twenty-foot branches and spectacular one-time summer displays of white flowers. The months of January and February are the best time to prune roses, according to Joe Truskot. Now is a good time to refresh your knowledge of this annual task, inventory your roses, sharpen your tools, and schedule your pruning session. You might also attend Monterey Bay Rose Society’s hands-on Pruning Clinic at the Santa Cruz County Fairgrounds, 10:00 to 12:00 on January 13th and 14th, 2018. Local rose experts will volunteer their practical experience with best practices in this process, which can add significantly to bloom production during the coming season. When thinking about irises, gardeners—and all garden groupies—envision the tall bearded varieties. Decades of hybridizers have tweaked these plants to produce luscious colors, fascinating forms, great productivity and disease resistance. They are excellent plants that are easy to grow and great assets in the landscape. The hybridizers are creative, imaginative, and extraordinarily painstaking and patient as they build upon past successes and pursue horticultural perfection, the definition of which continues to evolve. Home gardeners who enjoy these plants can be drawn into the endless process of acquiring the latest introductions featured in each season’s mail-order catalog photos. Each offers something a bit different and better than its predecessors. For many gardeners, this process can be absorbing and defining of the essence of gardening. Consider an adventuresome alternative: stepping off the bandwagon and exploring the vast array of related, less fashionable plants that can be equally beautiful with a more natural look, often relatively free of pests and diseases, and invariably less expensive. When it comes to roses, look for the “own-root” selections. These are plants that are grown from cuttings and do have developed their own roots, rather than being grafted on a rootstock such as “Dr. Huey.” These are often historic varieties or stable hybrids. The advantages of own-root roses over grafted roses include greater cold-hardiness, shapelier (because they do not grow from a graft), and complete absence of rootstock suckers. Mail-order sources of own-root roses include Heirloom Roses, High County Gardens, David Austin and others. Alternatives to the tall bearded hybrids include the beardless varieties. The America Iris Society identifies many species of breadless irises, organized in several series within subsections. For an excellent overview of beardless irises, search for Ben Hager’s article, “Beardless Iris,” on the Pacific Horticulture magazine website. One series listed by the AIS, Series Californicae, may be of particular interest to readers of this column. Most of the species in this series are referred to collectively as Pacific Coast Irises (PCIs), because they are native to and grow well in coastal habitats, like the Monterey Bay area. Right now is the ideal time to plant PCIs. Local hybridizer, Joe Ghio, has created many new PCI cultivars and won numerous national awards for his introductions. His catalog of both tall bearded irises and PCIs is available for $3 from Bay View Gardens, 1201 Bay St., Santa Cruz, CA 95060. The several groups of hybrid tulips include Darwins, Triumphs, Fosterianas, Gregeiis, Kaufmannias, Viridifloras, and others. These groups include many hundreds of cultivars that could overwhelm the most avid collector. All produce uniquely gorgeous blossoms, require a winter dormant period for reliable bloom, and attract gophers. Alternatives to these very popular plants, especially for areas without several weeks of cold weather, are called the species tulips. These are “the little bulbs that have given rise to all the big showy hybrids.” These smaller plants are native to areas around the Mediterranean Sea, the Caucasus Mountains, or Asia Minor, and grow fine in the Monterey Bay area. Species tulips that are good selections for the Monterey Bay area’s moderate climate include Tulip sylvestris (Europe), T. bakeri “Lilac Wonder” (Crete), T. clusiana var. chrysantha and “Lady Jane” (Iraq, Iran, Afghanistan), and T. saxatilis (Crete). Most mail-order sources of tulips, daffodils and other geophytes usually also offer species tulips. Look for them in the catalogs of McClure & Zimmerman, Van Engelen, Brett & Becky’s Bulbs, John Scheepers, and others. The message for today is about the benefit of study before action. This report happily does not include a disastrous mistake resulting from a lack of preparation. My occasion for garden research involves transplanting a large rose. A large rose can be an asset in the garden when it is in a place where it grows well and looks good. Occasionally, however, a rose that has been growing for years in a suitable location needs to be relocated. Reasons for transplanting an established rose usually involve landscaping issues: wrong color, need the space for a different plant, too close to a walkway, too big for the space, etc. Other reasons might have cultural factors related to soil quality or sun exposure. In my garden, the plant at issue is a Dortmund rose. This is a large climber that the American Rose Society has rated at 9.2 (“Outstanding”), in recognition of its glossy green foliage, crimson red single blossoms with a white eye, vigor, hardiness, and disease resistance. It is a popular and well-known variety hybridized in 1955 by The House of Kordes in Germany. It has been growing for several years in my garden on an arbor gate. Like all roses, it thrives in full sun, but it is being overshadowed by the growth of a very large Pittosporum tree. The Dortmund would produce an abundance of its gorgeous blooms if it were in full sun. At the same time, the time has come to complete another large arbor, elsewhere in the garden. That work has been scheduled and should be completed within a month’s time. The new arbor, in the middle of the rose garden, would be a fine location for a climbing rose, and a good, sunny home for the Dortmund. My Internet search on moving a large rose soon yielded the different procedures for transplanting during dormant and non-dormant periods. Early spring (about now) is the non-dormant or growing period, and still an acceptable time for this task. The most important preparation for moving a rose as it is growing is to irrigate it generously, to ensure that its cells are maximally full of water before cutting its roots. Treatment with liquid B1 transplanting fertilizer has been recommended as well, but field trials reported in Sunset magazine have demonstrated that plain water works better! Suggested supplementary treatments include Green Light Liquid Root Stimulator, and Dr. Earth Organic #2 Starter Fertilizer with beneficial microbes. These would be worth including. Other preparatory steps include cutting down much of the top growth to reduce demand on the roots and to make moving the plant easier. To transplant a shrub rose, cut the top growth to twelve-to-eighteen inches. A review of best practices for pruning a climbing rose, however, suggests retaining long, flexible canes to be trained to grow as horizontally as possible. Horizontal canes promote the development of vertical, bloom-producing shoots. As soon as the new arbor is completed, it’s rose transplanting time! It will soon be time for dormant pruning of your trees and shrubs. Pearl Harbor Day (December 7th), which reminds us first of when our gallant sailors and soldiers were attacked in Hawaii, also “triggers” rose pruning season. This day might be early for some, but noted local rose grower Joe Ghio has for years started his pruning on that date. He cultivates a lot of roses, so pruning is not a one-day event, as it might be for your collection. Still, this day reminds us to start pruning our roses, or at least to start thinking about this annual task. I have written about pruning roses before, and do not want to repeat the guidelines for gardeners who are already experienced pruners. Instead of detailing the process, I will offer some broad suggestions. First, if you are unsure of your pruning skills, visit the website of the American Rose Society for a refresher. Scroll down to “Pruning Roses” to find eight articles by experts on the subject. You will also see numerous articles on all aspects of the cultivation of roses. Second, let your roses teach you how to prune. After you have absorbed some basic ideas from the ARS, a book, or some other source, make mental or written notes of how you prune your roses, then monitor their responses over the next growing season. You might even tie ribbons on selected branches to remind yourself of what you did, and to help in watching the plant’s growth. Third, if you learn best from demonstrations, plan to attend one of the Monterey Bay Rose Society’s free rose pruning classes in January. The Society’s 2017 schedule includes classes at the Alladin Nursery (Watsonville), San Lorenzo Garden Center (Santa Cruz), and the Society’s Display Rose Garden in the Santa Cruz County Fairgrounds (Watsonville). In addition, Joe Ghio might present his popular “Anyone Can Prune a Rose” workshop during the Society’s January meeting in Aptos. For information on times, dates and locations, visit the Society’s website. McShane’s Nursery (Salinas) also provides free workshops on rose and fruit tree pruning. Visit the Nursery’s website for more information. Fruit tree pruning also can be challenging for backyard gardeners. The dormant pruning season for fruit trees begins when leaves fall and before buds swell, roughly January through March. I recently attended a workshop on pruning fruit trees, conducted by a long-time friend, Peter Quintanilla, who is a UC Master Gardener, an International Society of Arboriculture (ISA) Certified Arborist, and a teacher of Arboriculture and Landscape Pruning at Cabrillo College. Peter spoke at a recent meeting of the Monterey Bay Iris Society (the members of the MBIS are interested in more than irises!). I will write more on this subject as we near the pruning season, but now is a good time for gardeners to get “up to speed” on this subject. Find good information in your local public library or bookshop or on the Internet. For information on selected trees or shrubs (apple trees for example) try a Google search for “pruning apple trees” to find both article and YouTube demonstrations. Seasonal pruning of roses and fruit trees will optimize their appearance, health, and productivity. This task, when done in a capable and timely manner, also can be a satisfying exercise for the gardener. If you are unsure of your pruning knowledge, make a New Year’s resolution to master at least the basic techniques. And be sure to let Nature teach you about pruning. Water your roses during the hot summer to keep them happy and blooming! A month ago I recommended deadheading re-blooming roses to promote another cycle of blooms. Now, as the end of June approaches is the time to deadhead one-blooming roses, not to extend the season, but to support formation of the greatest number of new buds for the next season. Roses respond predictably to seasonal attention. One of my roses that should be deadheaded now is the prolific producer, Rosa mulligani, shown during its recent peak of bloom. If my schedule includes deadheading this plant during the next couple weeks, it will provide an even greater cascade of blossoms display next year. This time of the year is also a good time to contemplate roses in your landscape. The traditional time for such reflection is late fall and early winter when bare-root roses appear in local garden centers. These are often bleak days for the landscape when avid gardeners hunger for a burst of color in the landscape and respond eagerly to the enticements of dozens of rose photographs. That’s a good time to add roses to your garden, but not the best time to re-think the role of roses in your landscape. Many gardens include three or more (perhaps many more!) shrub roses, clustered primarily for ease of maintenance. In other words, there is a rose garden. The most popular varieties are hybrid tea roses, which cross Rebloomers and tea-scented roses from China, and modern English roses, which cross old roses with hybrid teas. The English roses, notably those by David Austin Roses in western England’s Shropshire County, combine several of the most appealing qualities of roses: hardiness, durability, and fragrance. The gardener cannot go far wrong by collecting English roses. If you are enjoying your rose garden as it is now, that’s fine. Still, consider fresh looks at your garden to explore new ideas and your evolving priorities. This approach can inspire creative challenges and new interest in gardening. Here are a few possibilities. Clustered plants. A popular recommendation is to plant roses in groups of three, to increase visual impact. This approach counters the familiar use of single specimens, which favors variety over garden design. A color-oriented theme. This could be a single color, e.g., white, different shades of a single hue, e.g., pink, or a combination of two or three colors that work well together. A bi-color combination of climbers on a trellis or arch can be striking. Touring rose varieties. Roses have been grown in temperate climates throughout the world for over 5,000 years. A long list of interesting varieties awaits your exploration. Begin an absorbing online research by entering “Wikipedia garden roses.” You could soon be on your way to comparing the common and uncommon varieties in your garden. Combining 0nce-bloomers and re-bloomers. The once-bloomers introduce a different rhythm to the rose season. Some are single-flowered, with just five or seven petals, offering an entirely different look in comparison to the lush varieties with as many as 100 petals. Sometimes, less is more! We have access to many fascinating varieties within the genus Rosa, even before exploring the ever-expanding universe of hybrids. Your gardening experiences can be enriched by adventuring through the genus. The vernal equinox is really more significant for meteorologists than it is for gardeners. Some plants respond to changes in day length, of course, but they don’t perform differently merely because days and nights are equal in duration. Still, the vernal equinox (March 19, 2016) is a useful marker for the change from winter to spring. As the world experiences climate change, scientists who study the seasons (phenologists) are generating more interesting reports about bud break, flower opening, insect emergence, animal migrations and other seasonal phenomena. We are already witnessing changes in our gardens: for example, my lilacs are blooming earlier than they have in previous years. Lilacs (Syringa vulgaris) typically require a significant chill during the winter months, but decades ago, Walter Lammerts, working at a southern California nursery now known as Descano Gardens, developed three low-chill lilac hybrids: ‘Lavender Lady’, ‘California Rose’ and ‘Angel White’ (pictured). 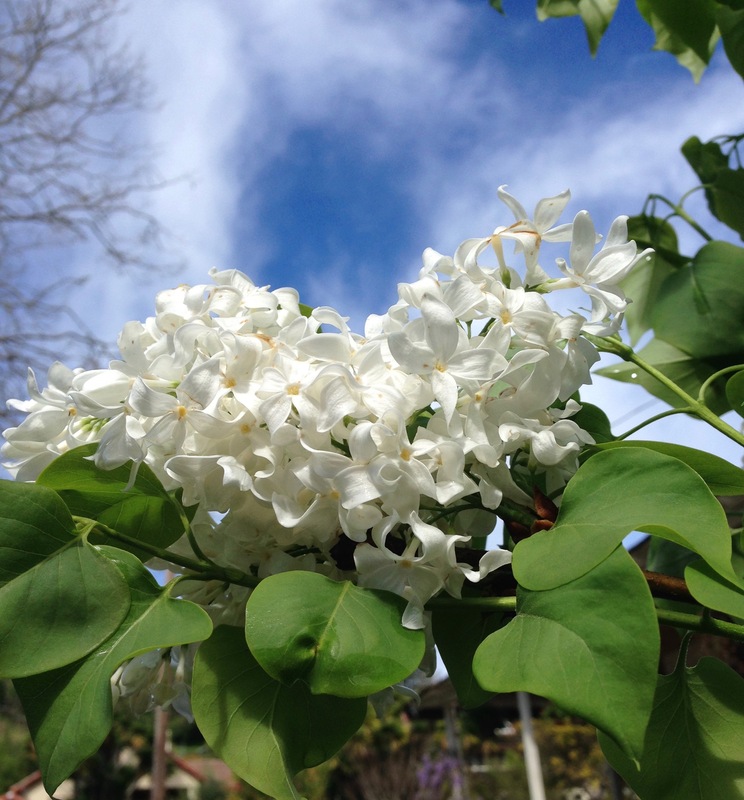 Gardeners in the Monterey Bay area and similar climates can grow Descanso hybrid lilacs and enjoy their fragrance. At the same time, my salvias are fading noticeably, earlier than I usually see. These two garden favorites have markedly different pruning requirements. The lilacs bloom on new wood, so they should be pruned soon after the blossoms fade, before new buds form. This work should be done before June. Another important maintenance issue for lilacs manages their strong desire to spread through underground runners. When allowed to roam for a few years, a healthy lilac will form a thicket. This may be desirable, depending on the shrub’s location within the garden, but containment might be appropriate. Accomplish this by the straightforward approach of excavating and cutting off the runner that has created the unwanted new growth. By contrast, salvias can be cut back to about six inches above the ground in early spring, as new growth appears at the plant’s base. Such renewal pruning cleans away the old growth and stimulates vigorous new growth on these garden standbys. The right time for this work will occur in about one month. It is OK to prune earlier before the new growth is evident, but the ideal timing will shorten the least decorative period for your salvias. A friend, busy with other priorities, saw the traditional season for rose pruning come and go this year, and now asks if she should prune her roses late, or let them go until next year. The general rule for roses is to prune during the winter months, when the plants are dormant. Still, the popular repeat-blooming hybrid tea roses should be cut back as blossoms fade during the summer months. According to David Austin Roses, this approach will stimulate blossoming and support maintenance of a desirable rounded shape for the plant. If a missed winter pruning has allowed a rose to compromise its overall shape, the gardener’s strategy should include summer pruning, cutting back stems after blooms fade with shaping the plant in mind, as well as encouraging new growth. Pruning can be a challenging task for the gardener because of differences in best practices for individual genera. A good pruning book can help to reduce uncertainty, put the gardener in control and make the process easier and ultimately creative. Enjoy your garden and keep your pruning shears clean and sharp.